The movie is no less enigmatic than its title. “Taking the Horse to Eat Jalebis” (Ghode Ko Jalebi Khilane Le Ja Riya Hoon), by the theatre veteran Anamika Haksar, is an intriguing hybrid of a feature and documentary, experimenting both with its form and structure. Premiered at the New Frontier section of Sundance Festival, the film at times seems rather a contemporary art video installation combined with an unconventional theatre performance. Opening titles inform us: „This film is culled from interviews and dreams of pickpockets, street vendors, small scale factory workers, daily wage earners, domestic workers, loaders, rickshaw pullers and many others labouring in the city of Shahjahanabad, Old Delhi”. And indeed we get an emotional, patchwork inner portrayal of a city within a city, woven from scraps of stories. But don’t expect typical postcard landmarks. 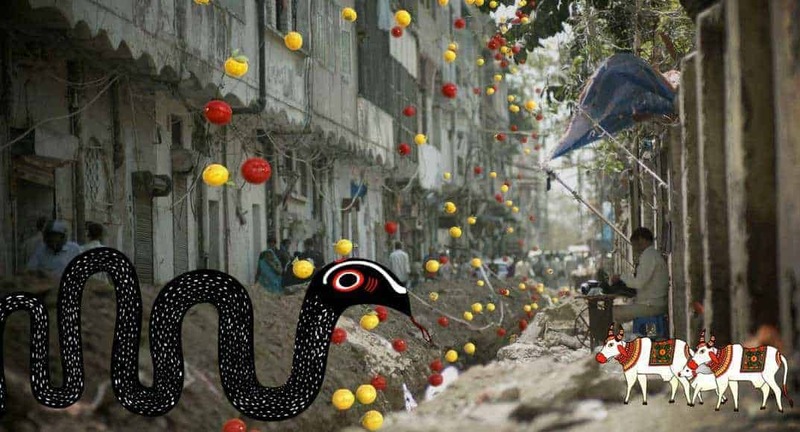 Haksar focuses on the Old Delhi’s underbelly, backside lanes, tangled bunches of electric wires, and people we tend to turn our eyes away from. The main four characters, recurring throughout the movie, are: a poetry-loving guide of heritage walks Akash Jain (Lokesh Jain, also credited as dialogue’s auteur and co-researcher), a pickpocket Patru taking care of an ailing father (theatre actor Ravindra Sahu), a streetfood vendor Chhaddami (Raghubir Yadav) and Lalbihari, a loading laborer, concerned about worker’s rights (renowned Keralan theatre artist K Gopalan). Apart from that, the film makers give voice to folk artists and those troubled by poverty, abuse by alcoholic spouses or work in inhumane conditions. Some of those sequences involve documentary-like style, some drift away from realism – like a powerful scene showing a porter carrying a heavy load. As it was explained in a promotional brochure, the crew “worked with several people from the streets of old Delhi. Over 350 actors from night shelters, peeli kothi slums, sadar bazaar workers, Jamghat and several other organizations.” There’s no linear narrative, lapidary scenes taken from ordinary lives are the fundamental of the script. But smart editing of Paresh Kamdar gives those bits a flow, combining them into a consistent amalgam of stories. The other impressive element is sound design. In one of the segments Patru decides to make his money the way Akash Jain does – guiding tourist around. However, while Jain shows the city’s past glory (narrating it in a delightful Urdu), Patru chooses its inglorious present. Though clients of both are the same – wealthy people searching for that unique tourist experience. Haskar seems to mock the modern tourist obsession with “real life”. When Patru shows his group truly “real people”, his clients are confused. A Caucasian girl insists on introducing her “folk stories”. When a woman met on the route tells about a personal tragedy – a loss of a child who drowned in a well, the girl shakes her head saying that this is not the kind of story she is looking for. The girl’s reaction is the same, when Lal narrates, how his brother was beaten to death in a jail. Both contrasting images of the city – poetic one, immersed in Delhi’s rich history, heritage sites and literature and the harsh reality of migrant workers living among ruins – are true. Occasionally movie invites us inside the character’s dreams. Quite literally. In the beginning, we see animated goddess Lakshmi throwing marigolds on a sleeping man. But devi is suddenly poked by a red fabric of a giant communist flag. Outside the dream, two men start to quarrel why they always have to interrupt each other dreams. Quite witty and bright interchange between the realism and symbolism. Though the film works best when it sticks to conventional narrative structures, and we can follow the characters’ stories and emotionally bond with them. With time, symbols, implemented animated elements and aesthetic experiments lose its charm of novelty. They begin to seem overused. Also the 120 minutes of length feels a little bit too much for that experimental format. For international viewers, unfamiliar with the Delhi’s history complexity, and the city’s topography, experience may be too hermetic, as no additional explanations are included making it inside the universe of unknown. However, despite those imperfections, the movie stays the alluring, hallucinatory journey, as well as a candid manifesto of artistic quest, challenging the viewer’s expectations and worn out conventions.